The Tax Angel on new site – Scribd. 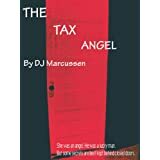 Read The Tax Angel for free! Just found out I was put on this site. It’s one of the top 20 media sites, a digital library including New York Times bestsellers. And me! Currently, you can download my story for free with a 30 day trial. Web, iPad, iPhone, and Android friendly. Hey, I want to thank everyone who reviewed my story. You are all great! She was an angel. He was a lucky guy. But when her job kicks into high gear, Michael is about to find out that the true test of love isn’t children or in-laws… it’s tax season.